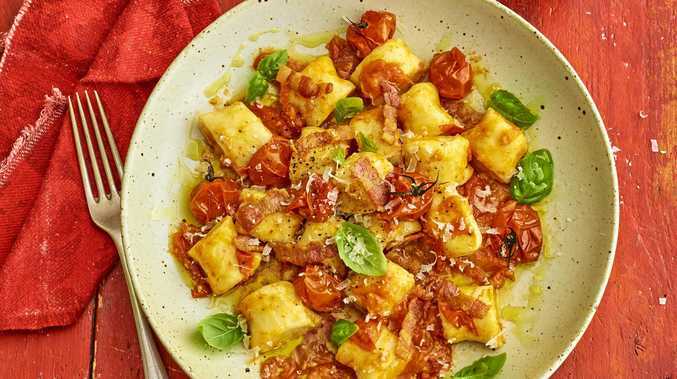 The Gnocchi Horror Picture Show: ricotta gnocchi with bacon and tomato sauce. ANYONE who knows me knows I love cooking. And anyone who knows me knows I love puns. 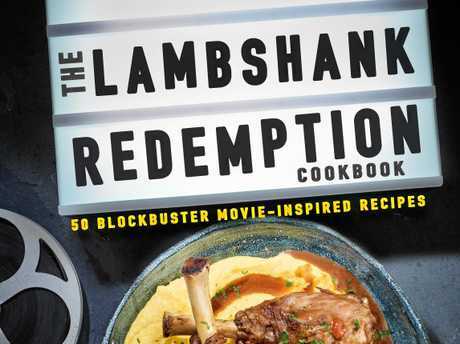 Now in one magical book my two great loves have combined - The Lambshank Redemption Cookbook: 50 Blockbuster Movie-Inspired Recipes. Yes, one clever guy (oh, why didn't I think of this myself?) has dished up a witty mash-up of movies and munchies in this new cookbook. Like to add some dramatic flair to your meals? Try the Dallas Buyers Crab, The King's Peach, Bratwurst at Tiffany's or the always inspiring Grain Man. If you're more of a cult buff when it comes to cuisine, then have a stab at Silence of the Clams, I Know What You Did Last Supper, Edward Caesarhands or The Texas Chainsaw Moussaka. And if you like to have fun with your food, then you'll be laughing with Cook-a-Dahl Dundee, Loaf Actually, School of Wok and Pine Nuts of the Caribbean. Keep an eye out for mentions of Clint Feastwood, David Lunch, Steve Sashimi, Chook Norris, Mussel Crowe and other foodie celebrities sprinkled throughout this book. Whether you're a Natural Born Griller or Lentil Miss Sunshine, if you love to play with your words as well as your food, then this book's for you. Sorry to mislead those of you looking for fishnets or Frank N. Furters. There is no seafood or sausage in this dish ... or Meatloaf for that matter. But, like the movie, it is fairly cheesy. Place the tomatoes on a large baking tray lined with baking paper. Drizzle with 1 tablespoon of the olive oil and roast in the oven for 20 minutes or until the tomatoes begin to collapse. Remove from the oven and set aside. Put the ricotta, parmesan cheese, egg and flour in a bowl. Mix the ingredients together until they form a sticky dough that comes away from the sides of the bowl. If the mixture feels too wet, add some more flour. Divide the mixture into four and roll each portion into thin lengths. Cut each length into 2cm-sized pieces to form the gnocchi and place on a floured tray. Bring a large saucepan or cooking pot of salted water to a boil. Add a quarter of the gnocchi and cook for 2-3 minutes or until they rise to the surface. Transfer the cooked gnocchi to a plate lined with paper towel. Repeat this process three times with the remaining batches of gnocchi. Heat the other tablespoon of olive oil in a large frying pan over a medium heat. Add the bacon and fry until it begins to turn golden. Add half the roasted tomatoes and use the back of a fork to squash them to form a sauce. Add the butter and stir until melted. Season with salt and pepper. Add the cooked gnocchi to the sauce and stir gently to coat. Add the remaining tomatoes and serve with a scattering of basil and extra parmesan cheese. This is an edited extract from The Lambshank Redemption by Lachlan Hayman, published by Dog 'n' Bone Books, RRP $39.99, and is available in stores nationally. Photography by Stephen Conroy.